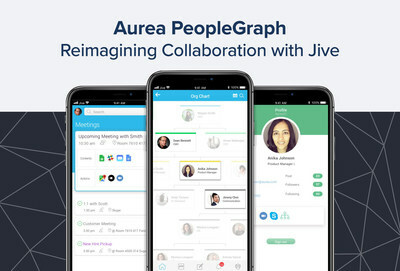 NEW ORLEANS, Dec. 4, 2018 /PRNewswire/ -- Aurea, the company behind some of the world's greatest customer and employee experiences, including Jive's collaboration solution, today unveiled its PeopleGraph platform, which extracts sophisticated relationship intelligence within organizations to power enterprise communities centered around people. At Aurea Experience 18, Aurea CEO Scott Brighton shared how the company is helping its customers unlock human potential and drive deeper employee engagement by leveraging graph database technology to fundamentally transform traditional discovery and collaboration experiences. "The nature of work has evolved dramatically as more global, virtual and distributed workforces have emerged, creating a clear imperative to re-establish people as the core of the collaboration experience," said Brighton. "That's why we reimagined Jive around PeopleGraph as an organizational 'brain' that understands each company's web of ever-changing relationships. With this powerful intelligence, Jive will deliver a vastly improved experience for enterprise collaboration." Contextual recommendations – PeopleGraph will help organizations accelerate their pace of content creation and reduce duplicate work by allowing Jive to recommend related experts and documents in real time as people work. Intent-based search – In order to help people quickly find what and whom they're looking for, the PeopleGraph search engine will go beyond keywords to truly understand the real intent of each search. Jive's new discovery experience will leverage advanced content semantics and valuable intelligence about each person's interactions to deliver better results. Intelligent news feeds – PeopleGraph will also eliminate digital crowding in Jive news feeds by leveraging its relationship web to prioritize the information people care most about. Reimagined digital diary – Jive's new mobile-first personalized assistant will save people time and ensure more successful, productive meetings. PeopleGraph will enable this by instantly merging a user's calendar appointments with recommendations of related people and information from multiple digital tools. These new collaboration experiences will be underpinned by PeopleGraph's highly scalable, graph-based data structure built on Amazon Neptune. Each community's PeopleGraph will use sophisticated algorithms to analyze its full spectrum of people-to-people, people-to-content and content-to-content connections, both within Jive and from other applications across a company's digital ecosystem. The platform interprets differing types and strengths of relationships – from hierarchical and explicitly defined connections, to implicit connections with people who have similar skill sets, interests and other affinities. Following the initial launch with Jive, Aurea will roll out PeopleGraph across its entire software library so more businesses can uncover and enrich connections inside and outside their organizations. Aurea Experience 18 spans two free events in Europe and North America, where Aurea customers and partners enjoy three informative tracks with more than 15 breakout sessions on employee engagement, the new digital workplace and customer intelligence. Speakers include more than a dozen customers from organizations such as American Airlines, Carlson Wagonlit Travel, Citi, Commvault, International Committee of the Red Cross, Lloyds Banking Group, Morgan Stanley, Pearson, Schaeffler, Vodafone Ukraine and more. In addition, the conference offers a "boot camp" track, where Jive community managers learn key skills, strategies and best practices for building strategic plans, increasing adoption and driving advanced community use cases. For more information, follow @AureaSoftware and #AureaExperience on Twitter. Aurea is the technology behind some of the world's greatest customer and employee experiences, for the largest and most successful brands. Aurea's platform, engagement and vertical solutions help companies create exceptional, end-to-end experiences for their customers – driving both retention and growth. Aurea's family of companies deliver process management, messaging, customer relationship management, email marketing, project and portfolio management, and collaboration software, as well as industry solutions for retail, insurance, energy and life sciences. Aurea Software, Inc. is an affiliate of ESW Capital. For more information, visit www.aurea.com or follow @AureaSoftware on Twitter. Aurea and the Aurea logo are trademarks of Aurea Software, Inc. All other trademarks referenced are the property of their respective owners.